In many cases, our parents are the most important, influential people in our lives. We owe them thanks for the good they provide and the love they show. One way to help players mind the importance of respecting their parents is to remind them their jerseys may have their parents’ names on the back; anyone watching the game will watch the players’ behavior and understand who raised them. These marches are fundamental movements that teach the players about proper running mechanics. Adding backward and lateral marches is essential for neurological variation in order to have success in subsequent movements. Players will march by walking and pulling their knees up, toes up, and arm up at a 90 degree angle. High knees replicates acceleration techniques by syncing the arm and leg actions. Be sure to cue arm action, encourage an elbow angle of approximately 90 degrees and promote movement at the shoulder. Proper leg action is demonstrated by an active drive of the knee upward while targeting the heel to the top of the hamstring and keeping the foot dorsiflexed (toes up). “Heel to hamstring” is an important cue in order to promote the proper shin angle. The players will run and quickly alternate bringing their knees high towards their chest. 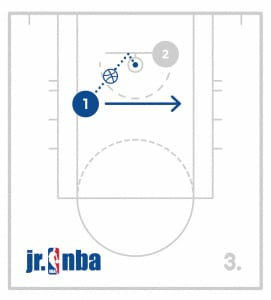 Players should take numerous tiny, quick, short choppy steps as they move in a direction instructed. The activity gets the players’ bodies moving and their foot muscles firing while working their fast twitch movement. Players should be in a slight athletic stance and move laterally by pushing off their back foot. The player should push off their left foot to move right and push off of their right foot to move left. It is important to emphasize pushing rather than stepping and pulling. This movement works hips, feet and balance. When the coach indicates, the players will start with the ball over their head in two hands. They will then slam the ball off the floor with force and catch the ball as it comes up quickly. The players are warming up their arms and hands while also working on catching the ball as it comes off the ground quickly. Ensure the players do this at their own comfort while also challenging themselves. Have the players get a ball and stand in an open space facing the coach. The players will start with the ball in their right hand and dribble the ball low from right to left back and forth only using their right hand for 15 seconds. Next the players will do the same thing at the middle level for 15 seconds and finally they will do the same at the high level for 15 seconds. This completes 1 set with the right hand. This drill forces the players to have good control of the ball and quick hands. Have players partner up with one ball and stand on the baseline about 6 feet apart. The players will sit in a good stance and slide to half court while making a chest or bounce pass to each other. Once all the groups have gone, they will repeat the same thing coming back for 1 rep.
Be sure to make both the chest and bounce. Emphasize good low slides, showing a target, hitting the target and working together. Have the players partner up and get 1 ball. The players will line up on the baseline next to their partner. 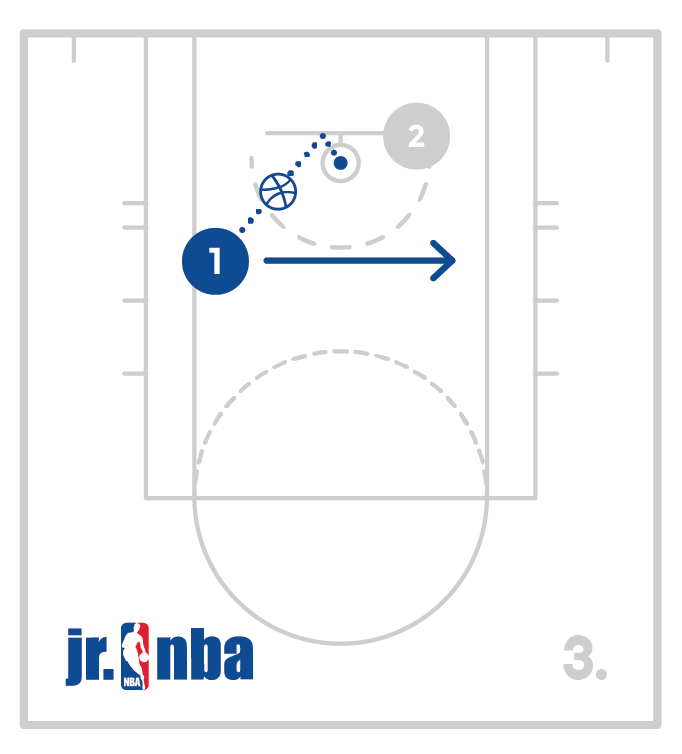 The first partner pair will run very close (inside the lane line extended) and pass the ball back and forth all the way down the court to each other. They will shoot a lay-up when they get to the other end. The next group will go immediately behind them. After all groups have gone, the groups will repeat coming back. This time they will take one step further apart from each other so the passes are a further distance as they run. Continue this process and have the players run and pass further from each other every trip to build on running and passing. Try to not drop any passes! Call each others name and lead the player with the pass. Have the players start in a line at the free throw line with the first player having a ball in a triple threat stance with their eyes closed. 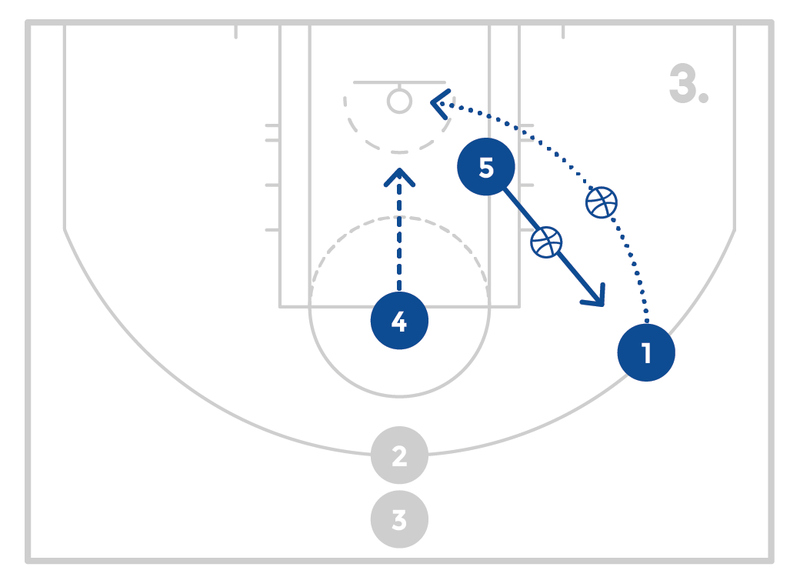 Have another 2 players, 1 standing on each block and a coach or 4th player guarding one of those players. The player with the ball will open their eyes on the whistle and make a quick decision to pass to the open player who will then shoot a lay-up while the defender will try to contest the shot. The passer will now take the place of the shooter. The shooter will take the place of the defender and the defender will go to the back of the line. Keep a tally of how many made baskets the team scores in 3 minutes so you can compete against this number in later practices. Make sure the defender clearly guards one player and does not leave that player until the pass is made! Have the player make a quick decision and a good pass to their teammate. 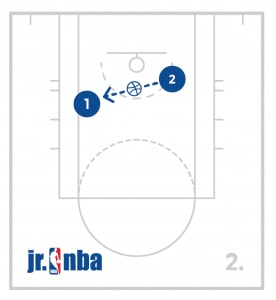 Next, make sure the receiver of the pass works on finishing the shots with a defender contesting. Since the team is trying to make the most shots possible, ensure that the defense contests hard. Have the players partner up with a basketball at a basket. The players should stand within a few feet of the basket and put the ball in their dominant hand in front of them. Have the players hold the ball with their elbow underneath it, and their palm facing the sky. The player will then add their off hand as support. When the player is ready, they should extend their knees and arm at the same time to shoot for the basket. Have the players hold their follow-through until the shot goes through the basket or misses. Have more than 1 partner per at a basket to maximize reps, space and time. Have the players start with their knees bent, elbow in and extend their follow-through with their elbow high and wrist flipped so that the ball has good arc and rotation. Have 1 player stand inside the 3 point line facing the basket in a good stance ready to catch the ball. Have the 2nd player standing under the basket with the ball. The player under the basket will pass the ball to their partner. On the catch, the shooter will take a 1-2 step into the shot and shoot the ball. The passer will grab the rebound and pass again until the shooter has made 10 shots. After 10 makes, the players will change positions and repeat the process. 1 player will start with the ball on the block. When it’s time to start that player will shoot and quickly run to the other block. The player or the partner will rebound the ball and pass to the shooter on the other block quickly. The shooter will continue going back and forth after every shot and the rebounder will continue to help rebound and pass the ball if needed. After 30 seconds switch and let the players change roles. Have the players work on using the backboard and hitting the square. Also have the partners count how many makes the shooter has so that they can try to beat their previous best score. Have all players with a ball and divided into balanced lines on the baseline. The first person in each line will start by jogging and dribbling to the free throw line. At the free throw line, the players will change speeds and explode out to half court. At half court the players will change speeds back to a jog until the opposite free throw line and then again explode out to the baseline. 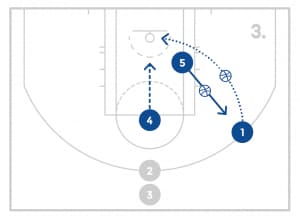 The first set should be down and back with the right hand, the second set with the left hand and the 3rd set with crossovers at the change of speed. 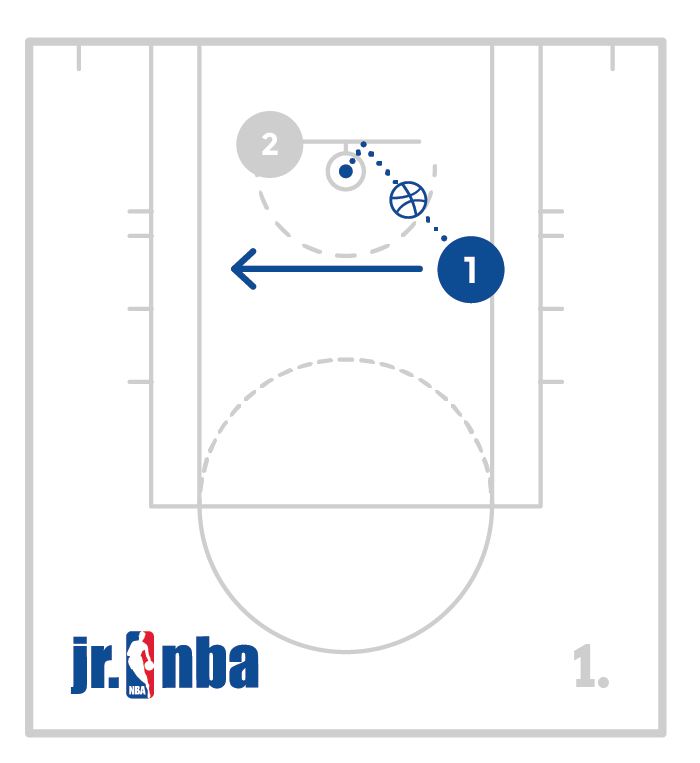 This drill works on developing rhythm and timing with the dribble. Being able to change speeds well, will help the players be harder to guard. 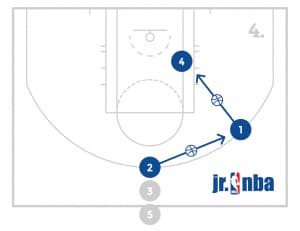 Start with a line of players near the top of the key with a ball. Put another player on the wing and another player on the block. 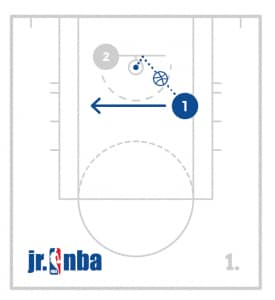 The first player in line will pass the ball to the wing, the wing will then make a post entry pass. After the post entry pass, the wing player will screen for the player at the top of the key who will come off towards the wing. After a quick screen, the player setting the screen will slip to the basket. The post player will pass to the player coming off the screen who will catch and shoot. The post player will get the rebound and move to the back of the line, the player who set the screen will become the post player, and the player who shot the ball will become the wing player. The next player in line will pass the ball to the wing and the sequence will repeat until the allotted number of shots have been made. If you have enough players, do the same thing on the other side of the basket and have the teams compete. Also if preferred, have the post player make the pass to the screener cutting to the basket. Have the players spread out throughout the court all facing the same direction. Have a player come to the front of the group and face them. For 10-15 seconds that player will work on defense while the rest of the group follows their lead. The player can do foot fires, slides, jumps, take a charge, get a loose ball etc. Have each player rotate to the front and lead the drill. Turning the dribbler means the defensive player sliding their body in front of a dribbler so they can no longer go in the direction they are going and they must turn and go in a different direction. 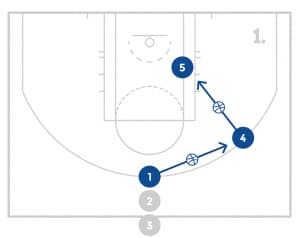 Have half the players line up on the corner of the baseline and sideline and the other half line up on the opposite corner of the baseline and sideline. The first player in line will start in a stance with his back to the court and slide back at angles touching their foot to the sideline and the lane line extended all the way down the court. Once the player in front of them gets to the free throw line, the next player will begin. 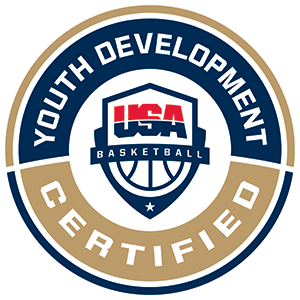 The players will work on pushing off their back foot, staying low having their hands out and moving quickly down the court as a defender. Have the players partner up and get one ball. There will be groups at each wing and at the top. One partner will stand just inside the 3-point line and face the basket in a stance. The other partner will stand behind them with the ball and touch the ball to the back of the player in front. When the player in the back with the ball pulls the ball off of the players back, they will begin playing one on one. The player in front will have to turn around and quickly try to locate the offensive player and play defense. The offensive player gets 3 dribbles to take 1 shot. Alternate possessions regardless of make or miss and play to 5. 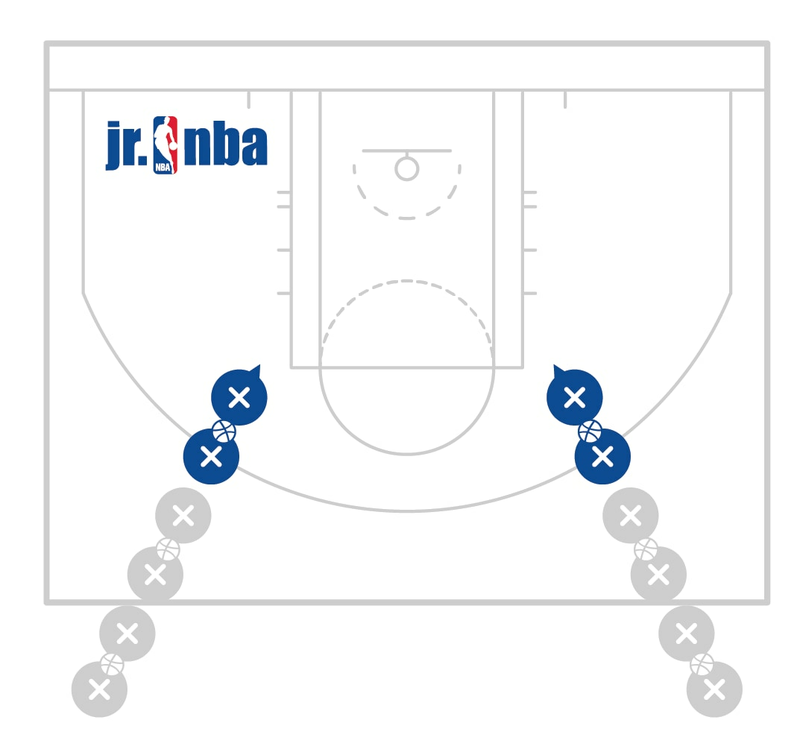 After 5 baskets, the players can change spots on the floor. The offensive player must make a quick and efficient move to score a basket while the defensive player must have quick reactions to make a good defensive play.